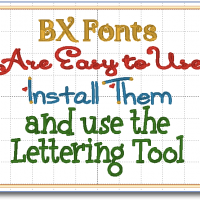 For those that are into machine embroidery, BX fonts are a pretty nifty time saving creative “format” created by Brian Bailie, the owner and programming genius behind Embrilliance software. I put quotations around “format” because the BX really isn’t an embroidery machine format like PES or DST. A better description is to say that it’s an installation file that is exclusive to Embrilliance and Designer’s Gallery EmbroideryWorks software programs. What does a BX font install? Well in a nutshell, when you add a BX font to the Embrilliance platform, you install an alphabet design collection (or design library file) so you can use access the alphabet designs using the lettering tool, just like a keyboard font. If you install a BX file that is a library of designs, it will show up in the library of the program. There is a great blog post that talks about the BX format and why its so wonderful on the Craftsy blog. But just think about it…. designs that are letters….typing with them makes logical sense. However, software can’t read, so it has no idea that a design that looks like a “letter a” is really a small letter “a”. When a digitizer “maps” their alphabet design collections – assigning each design to its corresponding keystroke and placing it on the baseline, and setting the default spacing – they can publish all of that information into a BX file which can then be installed into an Embrilliance program. As of today, there are about 150 professional digitizers that offer their alphabet design collections in the BX format. If you are a visual person, check out this video showing you how this works in less than 2 minutes. So BX files can be installed to the Embrilliance platform so they can be used with the functions you already have authorized. 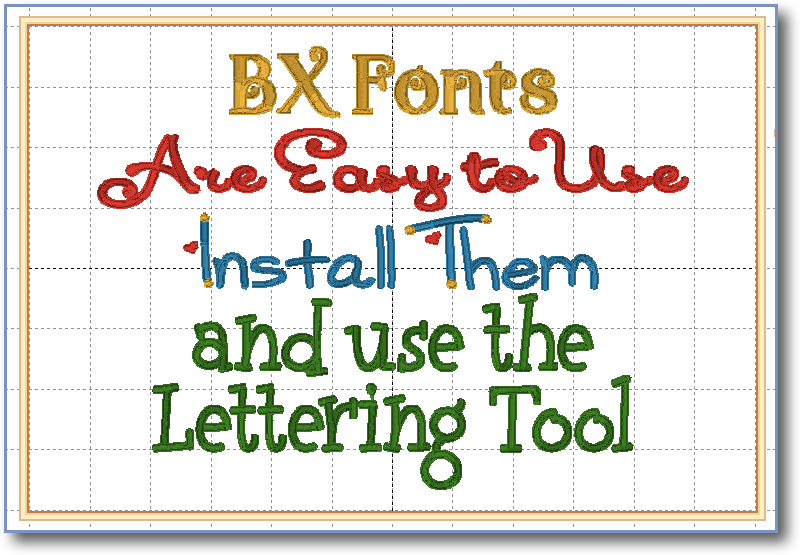 If you have Express – the free program – you are able to use the BX file as a keyboard font with the lettering tool and save to your format. If you have Essentials, you can do all of the Essential functions with the added fonts. You can resize, create enveloped monograms, create cut files from appliqué lettering BX fonts, sort colors, adjust lettering stitch properties such as compensation and more. Looking for videos on some of the cool things you can do with the lettering tool in Embrilliance Essentials? Check out this playlist. BX fonts have taken the machine embroidery world by storm and if you like to create lettering designs, they are something you should look into! Here is a link toa small script BX font that I have made available as a free download from my website.